Rye Harbour Marine is an approved Mercury dealer. We sell the full range of two & four stroke Mercury outboard engines. From the small 2.5hp to the massive 300 supercharged Verado we can supply the engine you require at a great price. We also stock in our shop all Mercury approved lubricants, spares, filters etc. 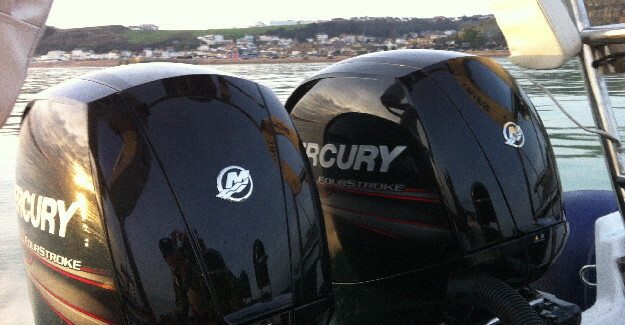 We have been successfully servicing all sizes of Mercury outboards for 15 years. From changing the oil to a complete engine strip down we have the tools and workshop to complete the work to the highest standard. We are authorised to carry out warranty work on behalf of Mercury should a problem that is covered arise. Please remember to have your engine serviced according to its manual so as to keep its warranty valid. If in doubt please Contact us to check if you need to have your motor serviced.